It's been quite a long time since I have posted on my blog, the last post was over a month and a half ago when I posted regarding the BlackBerry Z10 getting a serious price drop. I have been a long time BlackBerry user now, I used a Curve 9300 for a long time before I realized that it was time to move to some another device, not that curve was giving me some issues, but I had to move because it was becoming dated in terms of updates availability, i was stuck to BBOS 6 for so long and there would have never been an update to BBOS 7. I was, in fact I am a big fan a hardware keyboard and every one knows that there is no smartphone maker who makes even half good QWERTY phones as BlackBerry does. I certainly know they have been under some serious pressure and aren't doing too well globally. but that doesn't take away the credit from them of being the most comfortable typing experience provider, most secure communication etc. They have been always behind in terms of Apps, but I never felt that anyone actually needs a million apps on their smartphones, your iPhone cannot handle 500 apps. It just that everyone needs some handful of useful apps. Facebook, Twitter, Skype, Whatsapp, Instagram(Still not available on BB10), Viber and some other time killer games etc are enough for anyone to have on their smartphone these days. 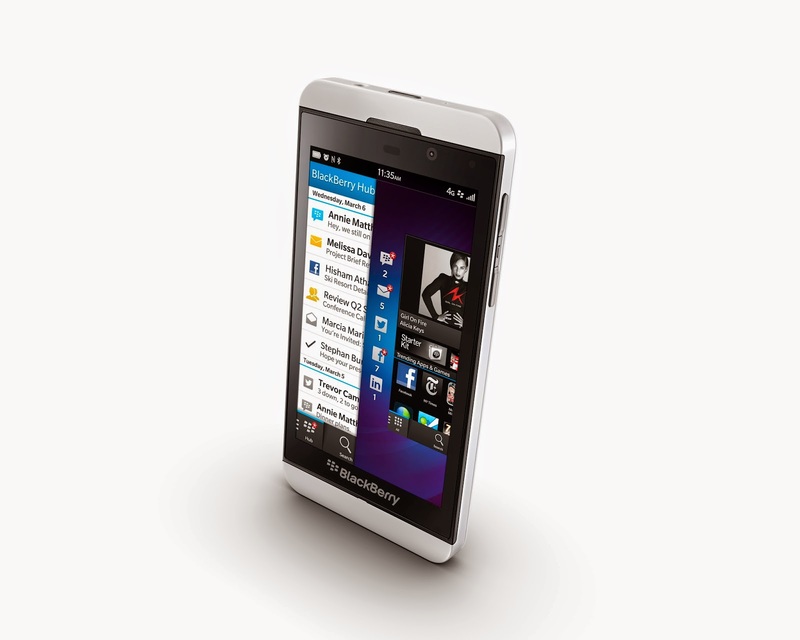 Anyways, lets get started with the review of the BlackBerry Z10, in detail. It's been a month and a half since I am using it, the very first thing I did with my Z10 was to update it to 10.2, so I absolutely have no experience of 10.0 or 10.1 or even how it felt using that. From unlocking your BlackBerry 10 device to getting it to bedside mode is a beautiful experience. I love the way I swipe up to raise the curtains and then pulling down to enter bedside mode, setting the alarms, every bit is truly a masterpiece. The hardware has always been great from BlackBerry and they don't disappoint this time with their sleek and comfortable housing. I have got a white Z10, which beats the iPhone 4s, iPhone 5 and the Galaxy series easily on looks. Lets head to the OS and other stuff. BBOS 10.2 - A unique blend of smoothness and pace, along with brilliant control of your actions. It gets to know you with every single day. I am amazed how it's keyboard has adapted to my typing that it took me a couple of days to even realize that it actually had adapted me already. The hub is the best of all the available features. UI is great, and browser is great too. The app world is slowly getting there with new apps being added with each passing day, of course not at the pace at which Android or iOS are getting them, but it surely is doing all right. BlackBerry Keyboard - I remember how Thorsten Heins touted the new BlackBerry touch keyboard before and during its launch, and it was obvious and a mandate for them being a best typing experience provider to continue providing that same experience even on a touch device. The BlackBerry touch keyboard is THE best typing experience I ever had, period. It beats every other touch keyboard hands down and there is not competitor on this front. It does not auto correct you with those silly and sometimes embarrassing suggestions and intelligently learns the way you type. After a few days of usage and typing, you will realize that it has learnt what you type, and more importantly, the way you type. My priorities on phone are Emails, followed by browsing and messaging, and I actually don't remember when was the last time I typed a complete word on my keyboard, all I have to do is to flick up the words from the suggestions, and mind it, it doesn't provide foolish suggestions, they actually make sense. Sometimes, I flick every word while typing a mail realizing how easy and time saving it is, and smart too. A perfect 10. The BlackBerry Hub - Just like the BlackBerry 10 touch keyboard, here is another masterpiece, the hub. I have kept my facebook, twitter, whatsapp, linkedin all under on folder which I have never opened, because the Hub lets me access all these from a simple gesture from any app, yes, your read it right, from any app, you just have to swipe up and then right, there you have, all your communications, emails, chats and messages in one unified place, the BlackBerry Hub. Now, with the priority Hub, you can even priorities the important communications. A perfect 10 here as well. Camera - There you have it, first area of concern where I would rate it below every other smartphone camera, though it is not bad, but not as good as an iPhone's 8 mp camera. The timeshift feature is truly impressive and I always brag about it, because that the only good thing about Z10's camera. The downside is actually it's low light clicks. The daylight clicks are impressive but the low light clicks overshadows it. In any case, it scores 7/10 here. Now, the outcome, as I have mentioned many times on my blog that why Z10 and other BB10 devices failed to impress people was that it never reached their hands, they were priced too damn high. Now, when they finally decided to retail it at 18K, it was a killer buy and it proved to be with the empty stocks in India right after it was announced at the reduced price. Overall,, a great smartphone.